University of Delhi is one of the most renowned Universitythat is located in Delhi. It offers admission to Undergraduate and postgraduate courses.Delhi University offers admission to the various undergraduate courses on the basis of Class 12 merit.All the students from every part of India want to seek admission in the prestigious Delhi University.Delhi University that was established in the year 1922 has two campuses that is the North campus and the South campus.Delhi University also gives a relaxation in cut off marks for girls in some colleges. IP College of Women is the oldest women college under Delhi University. 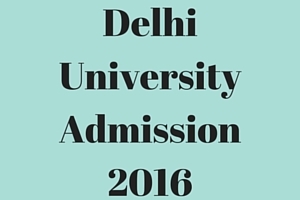 The University of Delhi offers admission to unreserved category, SC, ST, ECA and sports category students. Delhi University offers admission to the candidates who have filled the complete application form on the basis of their Class 12 merit. Delhi University declares its cut-off list for the students and those students who fulfill the eligibility criteria and the cut-off marks as well can take admission in Delhi University. This year the university will declare 5 cut-off lists. Students will get 3 days to complete the enrolment process under the first five cut off list. From this year onwards Delhi University Application or registration form can only be filled online by the candidates. Previously Delhi University forms were also available in offline in the College campus and other stalls as well. DU JAT: this entrance exam is conducted for BBA, BFIA, and BA (H) Business Economics. Delhi College of Art exam: This entrance is conducted for BFA course. IP College for Women: BA (H) Multimedia. Delhi University conducts Online Centralised registration process for all the colleges affiliated under it. Previously St.Stephens and Jesus and Mary Colleges used to have their own registration process. But from this year these two colleges have also joined Delhi University’s Centralised Admission Process (CAP). The other three minority colleges that are SGTB Khalsa College, Mata Sundari and SGND Khalsa will have 50% Sikh minorities and will have their own admission process but will accept application through the centralized application process. Apart from the regular courses that are taught in various colleges under Delhi University, it has also two open learning colleges. One is School of Open Learning most commonly known as SOL and the other is South Delhi Study Centre. There is no age criteria for admission in Delhi University. Students can fill as many courses as they want for admission to Delhi University. The application fees for Delhi University are Rs. 100 for general category and Rs. 50 for SC/ST candidates.